The 2-in-1 Drummer is a fun, challenging collaboration between Cuban drumming legend Walfredo Reyes, Sr. and Elliot Fine, co-author of the extraordinarily influential drumset method classic, 4-Way Coordination. 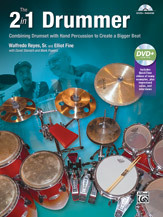 By combining standard drumset rhythms with established percussion rhythms for a single player, this inspiring book/DVD study will teach you how to create a "bigger beat" in a wide variety of popular musical styles. Hence, The 2-in-1 Drummer!